Block 8 of Frosty Flakes...download HERE! How are your little snowflakes coming along???? Maybe we can have a parade when they are finished? Thanks again Dawn! Fun to do, roll on next week.....Mmmmm what colour will I do this weeks Frosty???? Thanks Dawn, I feel Christmas approaching already!! Gracias Adelaide!..Me está gustando mucho hacer tus copitos!!!...jeje..Besos. 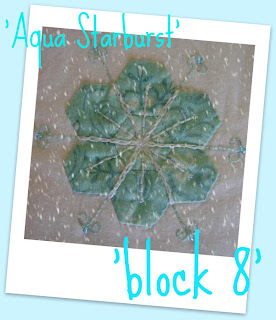 Your block 8 is beautiful but I cann't download it. I have finished the first 7 blocks and find them very good. I am so far behind on your lovely hexie snowflacks. But I love them. They are wonderful. Thank you so much for sharing. Thanks for the Frosty Flakes downloads. They are so nice! I came here from Cyndi's. Hi Dawn, I came here from Cyndi's blog! These frosty flakes are wonderful! You are so creative. I am currently loving aqua, so this one is a real hit!